"Eve and Acacia met in self defence class just over 6 months ago and immediately connected over a shared interest in fair, sustainable clothing. After sharing countless cups of coffee, reading lists, impassioned discussions, wistful dreams and sweaty training sessions, they discovered that Acacia's background in community development, and Eve's in fashion and textiles, were just what the other needed to start stirring up the industry. New Mode Collective was born as a platform to share all they have learnt about clothing; the people who make it; and its effects on our precious Earth. In May 2017, they created a clothing supply chain installation and facilitated a series of workshops on sustainable fashion at Moral Fairground’s Victorian Fair Trade Festival. 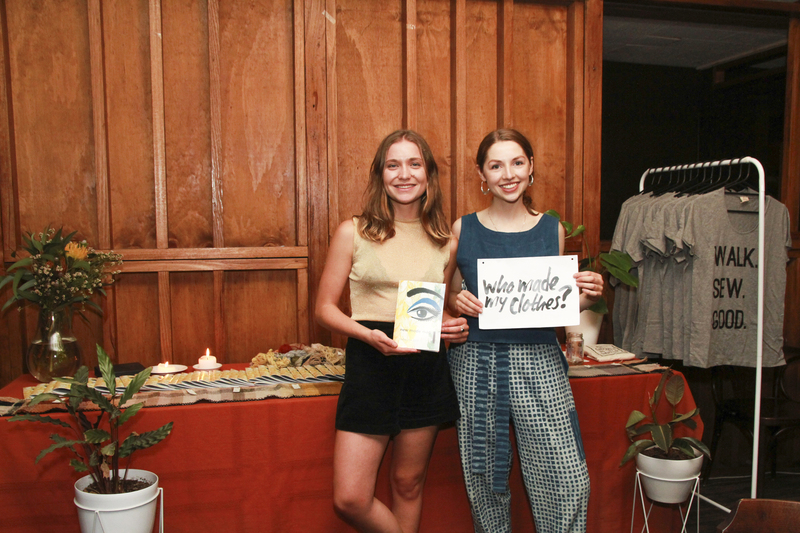 The positive responses were overwhelming, and served to reinforce their belief that education and access to ethically produced, sustainable clothing must improve fast! Propelled by the fires in their bellies, they showcased the exhibition again in December and launched the first edition their zine, New Mode Mag. They are now embarking on their biggest venture yet; New Mode Fashion Festival (NMFF), March 3rd - 11th, in Fremantle, WA. Thus far, their projects have focused on education and, while they recognise the importance of this, they have come to realise that a barrier for many people is lack of access rather than knowledge. Outside Australia’s major cities, sustainable clothing is available almost exclusively online, which makes curating a thoughtful wardrobe daunting for many. As part of NMFF, they’re launching The Fitting Room, a pop-up retail space where people can try on sustainable garments before buying them online. They’ll be hosting an industry conference on ethical business, a screening of the harrowing yet inspiring documentary, River Blue, and an Emerging Designer Showcase of Perth and Melbourne’s fledgling conscious designers. Crowdfunding has proven to be a perfect way to galvanise support for these projects, and Eve and Acacia can’t thank Chuffed and their supporters enough for making it all possible!"